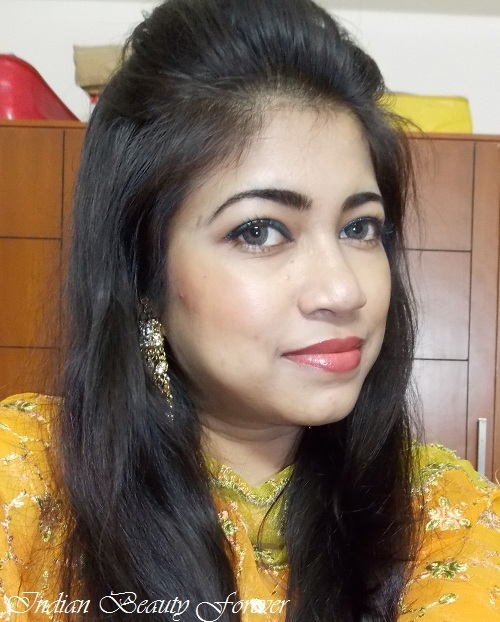 Home > makeup look > Festive Makeup Look with Elle 18 new products!!! 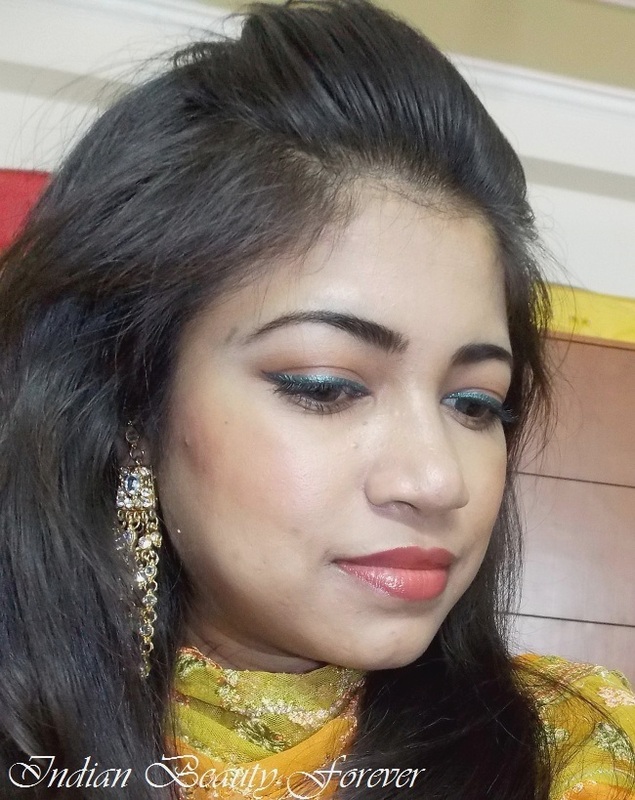 Festive Makeup Look with Elle 18 new products!!! I posted the Elle 18 new collection pictures recently, if you remember! 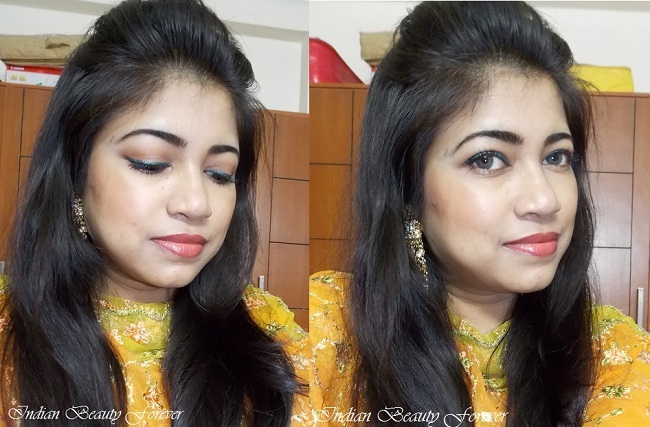 I will be sharing this simple Festive makeup look for our traditional outfits using Elle18 products. So, if you are on a budget then it can give you an idea. 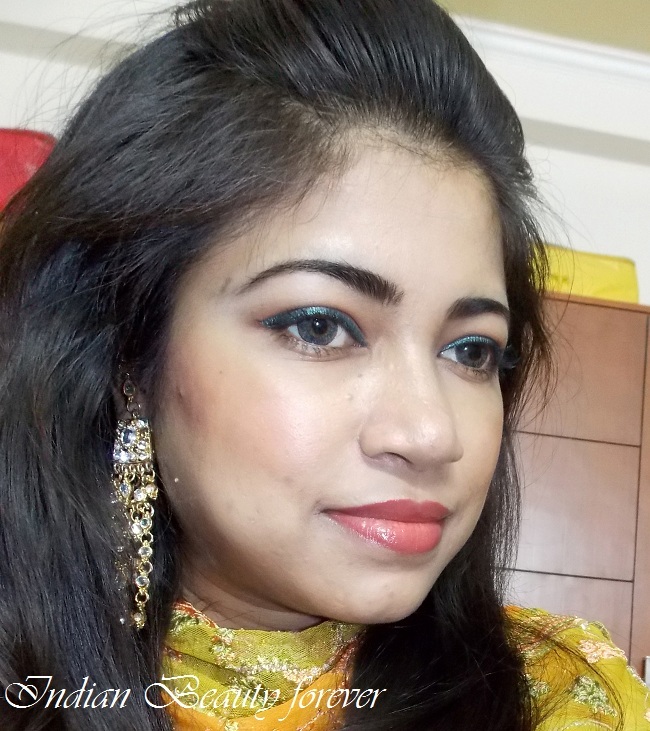 To achieve this look, I have used their foundation in Shell was a tad darker than my skin but as if was sheer it matched somehow and then I used their compact to set my makeup. For the eyes, I have used their color pop eyeliner in Green and juicy lip balm in Juicy Berry, which smells delicious. I just added a medium brown matte shade on my crease, to define my eyes. Before applying this balm I have used their Color pop lipstick in rusty which is exactly the same shade as that of the juicy balm. Will be doing the full reviews soon! And also, Tomorrow I will be starting a Contest/giveaway sponsored by Elle 18 where you can win the goodies and hampers of the same!! So stay tuned and hope you liked the look! I love these elle 18 liners, planning to buy all the shades. Very pretty like this makeup. Absolutely pretty Nieshu. The green shade looks classic! Hi dear Niesha =) You're so beatiful in this pics !!! I am too liking the liner a lot! ooo la la...oo la la.. It's was actually a yellowish orange with green. :) Gifted to me by him! U look lovely...and hows their compact n foundation? Worth a try for combo acne skin? Thank you Adity! 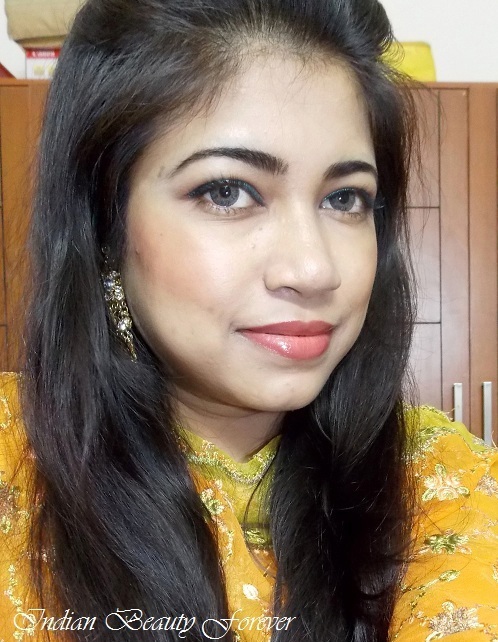 I have used the foundation and compact only for this look, so, I need some more time to test it before the review. let see if it breaks my combi skin or not! Thank you Shikha!! It's their juicy balm with rusty lipstick underneath. 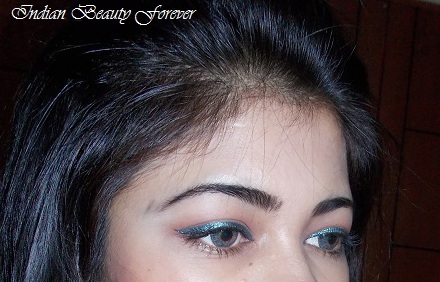 Gorgeous look Niesha :) Love your eyeliner application.. Thank you! I really like their eyeliner too, they are really good! Lovely look! so in love with the eye liner!!! Thank you!! same here, i love this khaki green color. I love the metallic pop of liner on your eyes and that peachy lip is so beautiful! Even I love the metallic eyeliner color. Thank you Sharlynn!! You look beautiful <3 The Color pop liner looks great on your eyes!!! Beautiful and simple look :) The green pop liner looks great! Elegant and pretty Niesha,i just really like the way you do your brows. You look beautiful there Niesha! Love the FOTD. Very pretty look dear :) you should do more of such posts..
Niesha you looks very beautiful here! so pretty you are looking.....this range from Elle 18 looks quite interesting :) I want some!! Very pretty and you have beautiful eyes! Hi Niesha! You look stunning. I was wondering is there a site to get Elle 18 shipped to international locations.. I live in Australia and I wana try it :-) any help would be great thnx! Hi Vaish! Thanks a lot! :) I dont think so, there is any site that can ship it internationally sadly! Maybe jabong.com does but they dont have Elle 18 products.